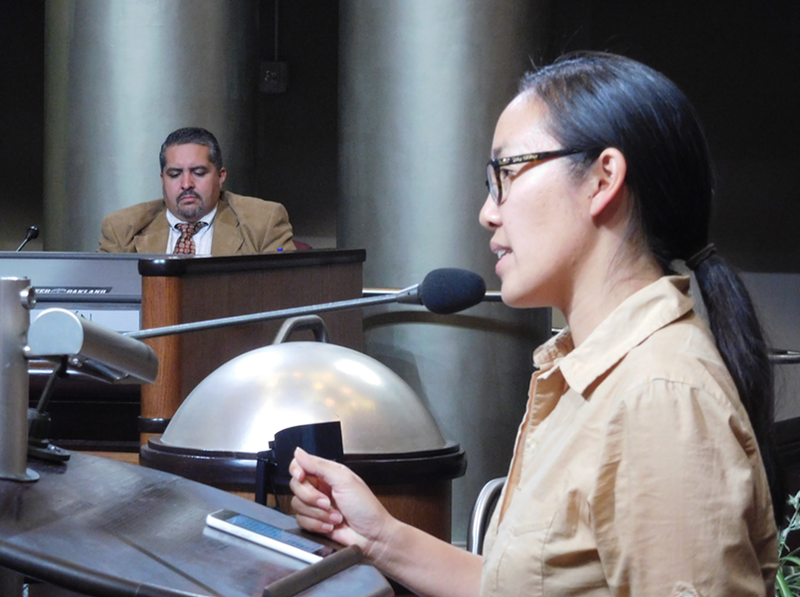 Lailan Huen addresses Councilmember Abel Guillen and the Oakland City Council. 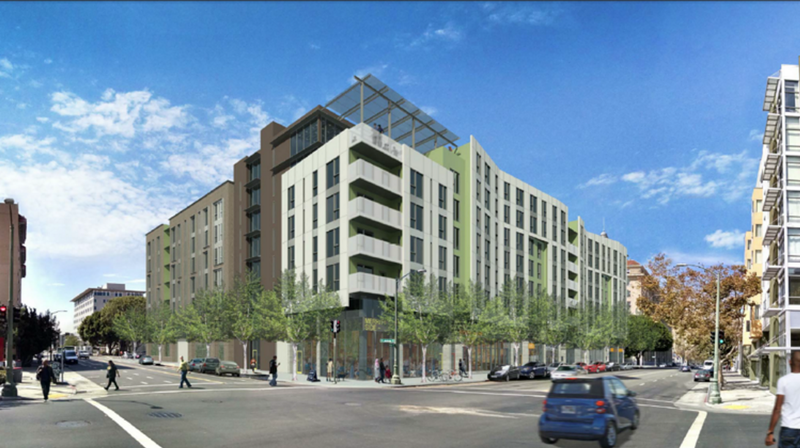 Oakland City Councilmember Abel Guillen announced tonight that a deal has been struck allowing a 262-unit apartment project to be built on the edge of Oakland's Chinatown. "Thanks to all parties for helping us build much needed housing in Oakland," Guillen wrote in a statement. "It took six months," said Ayodele Nzinga during tonight's city council meeting when the deal was announced. Nzinga is a member of the coalition that negotiated with the developer, Wood Partners, for a community benefits package. The deal includes funding for anti-displacement programs, arts and culture resources, job training funds, and affordable housing that will be built in the same neighborhood. Lailan Huen, a member of the Chinatown coalition, said the deal with Wood Partners totaled about as much as the developer would have paid in impact fees. Guillen put the total dollar value of the developer's contributions at $1.8 million. Wood Partners' 262-unit project will be built at 226 13th Street. Because Wood Partners gained approval for the project before the implementation of impact fees, they are exempt from paying the $7,000 per apartment for affordable housing. But Wood Partners is agreeing to make a $675,000 contribution to help build 60 affordable housing units in the neighborhood. Other parts of the agreement, according to Guillen, include affordable retail space for use by small businesses and artists as part of Oakland's new Black Arts Movement Business District; $100,000 to help the Cypress Mandela job center train Oakland residents for construction jobs; a 20 percent local hire goal for the project's labor; a $250,000 contribution to anti-displacement programs; and a one percent art fee that will be dedicated to the Malonga Center. "This project predates impact fees, although the amount of the community benefits package approximates the value of the fees that would have been collected had the law been in effect when the project was first presented to the City," Guillen wrote. Huen and Nzinga said they were pleased with the outcome, although it required filing an appeal against the project after it was approved by the Planning Commission. Their coalition also pressured Guillen and the council to pull the appeal item from the city council's agenda on several occasions in order to gain more time to negotiate with Wood Partners. Huen said the coalition is engaged in similar talks with other real estate investors. "We don't want to have to fight every developer," she told the council tonight, adding that many Oakland residents want a more comprehensive set of development policies implemented by the council, in addition to the recently passed housing and infrastructure impact fees. Wood Partners could not be reached today for comment.